With a whopping winner’s prize of £5,000 up for grabs it was no wonder last week’s R&J Pipework match attracted a big field of top anglers from all over the country to Decoy Lakes, Whittlesey. With most of the lakes in use, those with a little extra room were always going to be in with a chance and so it turned out. Peterborough bailiff Mark Smith is pictured with an 11lb 6oz barbel - one of three he caught during a short stint along the Castor section of the Nene. Multiple barbel catches are far from normal on the Nene, especially in the current hot conditions, so one was good, three is exceptional. He caught all three fishing on a glugged 12mm halibut with a maggot feeder full of pellets to give off a constant scent trail and fished over a bed of hemp. Graham Dack drew peg 24 on the Elm Pool and put a massive 267lb to the scales to comfortably take the top spot and the huge pay-out. He loose fed six pints of casters and fished red maggots on the hook to take carp to 8lb and a few barbel. Runner-up and best of the locals was Barry Mason from March. He drew peg 25 on the Willow Pool and after a slow start caught well on a small Method feeder to finish with 189lb 5oz and take home a cheque for £1,000. Mark Goddard (174lb 13oz) was third and Matt Arnold (168lb 2oz) fourth. A charity match run by Barry Mason at Decoy Lakes on Saturday raised well over £1,000. Winner with a huge 224lb 11oz from peg nine on the Yew Pool was Adam Major. Second was Simon Godfrey with 223lb from the Oak Pool, then came Ray King on the Willows with 184lb 1oz. On Sunday JVAC fished two pools at Decoy, Lou’s and Four Islands, and both waters fished really well despite the hot, sunny weather. 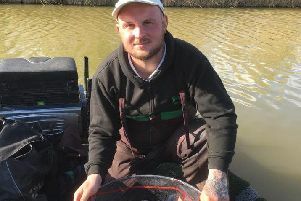 Topping the list from Lou’s was Nick Carlton, who fished a small feeder on peg 10 to finish on 183lb 2oz. Second from peg six was Mick King with 149lb, followed by Colin Fisher on 132lb 6oz. Over on Four Islands the clear winner with 120lb 11oz was Paul Irons. He fished the pole taking a net of barbel on red maggot. Jim Regan came in second from peg 10 weighing in 110lb 2oz, and Gus Gausden was third on 105lb 5oz. Hotpoint AC fished the in-form Elm Pool and it didn’t let them down. The best weights came from the top end of the lake where leading the way with a net of big carp taken from the margins with paste was Paul Faulkner on peg 17. He weighed in 175lb 15oz. I drew fancied peg 12 and made a bit of a mess of it. I struggled to catch well in the first half of the day and left it too late to fish into the margin and had to settle for the runner-up spot with 149lb 10oz. Third was Vincent Stapleton, who caught on the feeder with red maggot for 141lb 1oz. Ramsey AS fished the Beastie Pool at Decoy and Andrew Rayment was a winner. Despite falling foul of the net rule he still topped the field with 110lb 8oz from peg 25 catching carp and a big net of skimmers on maggot. Runner-up was Vince Hull with 104lb 4oz, then came Andrew Wilding on 85lb 12oz and Keith Rayment with 78lb 12oz. Oak Pool at Decoy Lakes was the venue for the Over 55s match on Friday and Dave Rowell took the honours with a net of carp taken up in the water on pellet for 142lb 15oz. Second place went to Mick King with 118lb, followed by Pete Holland with 103lb in third place.